Bring the focus to your tasting room. By now, most wineries are fully staffed with not only year-round associates but also seasonal temp staff. It’s a busy time in the tasting room, and there are plenty of moving parts. Each one of our team members—whether permanent or temporary—represents our brand. We want it to be presented by different staffers the same way, with the same vision or "voice" and standards. Our guests aren’t going to know—and frankly shouldn’t know—what type of staff member they are interacting with. We need to help our staff be a successful, well-run team. With so much going on, it’s difficult to keep everyone on the same page—whether it’s "what’s on the agenda today" or "here’s how we treat our guests." Bad customer experiences usually happen when our backstage is not running smoothly or is inadvertently “showing.” Two areas that are usually the reason why things fail: lack of organization ahead of time and communication. 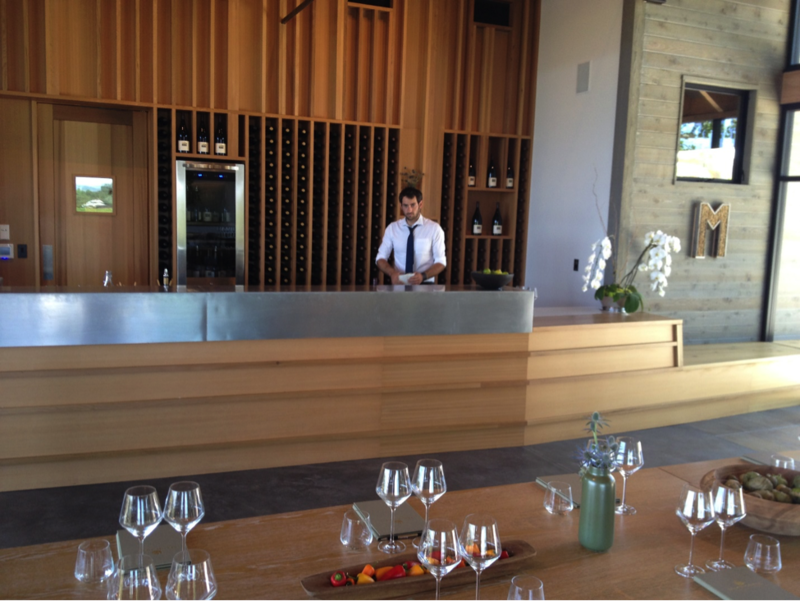 A quick refresher: Think of each winery experience as a production or a performance. (This is the stage, and it includes everything the guest sees, hears, touches and smells.) The “backstage” is all the things behind the scenes that need to take place in order make sure there is a great front stage performance. You never want your backstage to be showing in front of the guests. Physical Backstage. Ensure everything is ready to go before guests arrive. Even if things go off the rails, guests will never know if we stay prepared. Think of the swan. Above the surface, all we see is grace. Beneath the surface, those webbed feet may be paddling like mad, but you'd never know. That’s grace under pressure. Never let them see you sweat. MacRostie Winery & Vineyards in the Russian River appellation of Sonoma is a pretty recent addition to the west side of the little town of Healdsburg, Calif. I went there last week after a friend of mine mentioned that he was greeted with a glass of Chardonnay, in a Riedel glass, in the courtyard of the winery before he entered the tasting room. It was a story worth checking out and, if true, sharing. While getting out of my car a 100 feet from the tasting room entrance, I saw a young man wearing a tie walking toward me with a glass of white wine in his hand. One of the visitors taking a walk? No, it was Russell Sheldon, sous-chef and wine ambassador, greeting me. You don’t see that very often. When you want to be the best, your actions need to reflect your goal. Congratulations, MacRostie! Wine Country-Themed, American Made Gifts from Mercantile 12. Localized collections, customizable, & popular tasting room merchandise! An all-day wine packaging conference for industry experts: examine the latest improvements in packaging and discuss how to implement them. Verbal Backstage. This refers to any inappropriate attitude or comments made in front of the guests. As part of your communications, make sure your team is aware of what is appropriate to talk about in front of guests (and how they should communicate with them) but also how to take things off-line or backstage. No one wants the magic ruined, so communicate that if it’s not part of the wonder of the experience to table the discussions until a more appropriate time. The best way to make sure everyone understands what is going on and what is expected from each of them is to communicate. In this busy season, over-communicating may not even be possible. Quick Meetings. One way to help ensure the team is aware of what is going on is to have a daily 15 minute meeting—or at least on the high-traffic days. Review all your "housekeeping": what appointments are booked, who is assigned to which task, how many buses are expected, etc. Review the goals: what they are, where you stand, etc. Then open the floor and check with the team on any concerns they might be having. Try to iron out all the details as much as possible before the day begins. Monthly Meetings. Have a longer monthly meeting to discuss more in depth the pain points of the team and how to work together to overcome issues. Help them to be successful and try to use the last portion of the meeting for motivation. For example, recognition, goal review (if positive otherwise bring it up sooner), top sales people, etc. Focus on the teams’ strengths. Communications Board/Binder. Choose a place for your team to find new or updated information that isn’t verbal…just in case they missed the email, meeting, etc. Every time a new person starts a job—no matter how skilled or unskilled—a certain amount of training is required in order for them to perform their assigned tasks to suit the specific needs of the winery. Train all employees, not just seasonal employees, to understand and embody the brand’s commitment to their guests’ experience. Give them training that encompasses skills that build rapport and trust with our guests, skills that differentiate our brand, and skills that help them sell professionally and naturally, are all ways to prepare staff to own the customer experience. Choreographing. Create "staging" of the guest experience by coaching staff on which key brand points to cover at specific locations during the tour or at specific intervals during the tasting. This choreographing ensures every guest is afforded the same level of service, education, and experience. Sales Training. Training is essential for all staff, whether it’s a refresher or new material for new staff. Create mini-trainings for staff on your wines, winery and procedures. Send team members to be WISE-certified (shameless plug!) or have onsite training. Staying disciplined in our preparation, training, and communications with the team (and across departments) is critical to captain a well-run tasting room team. Things are warming up. If we’re going to get in the water, we’d better be ready to swim! In an article by Andrew Adams of Wines & Vines, Pinot Gris/Grigio and sparkling wines help boost the continued growth of wine sales during the month of May. 48% Import Duties on American Wines! Chinese consumers are buying wine online, but with an average price of $16 and taxes at 48%, American wines may be too expensive. Read the full article by Kate Lavin of Wines & Vines. How High are the Wine Taxes in your State? This article by Samantha Jordan and Scott Drenkard of the Center for Tax Policy presents an easy-to-read chart of U.S. excise taxes per gallon of wine…How high are the wine taxes in your state? May 2015 numbers are now available from Wines & Vines. Unlocking Wine: Sensory Evaluation of Wine, Wine Retailing and Craft Brewing are three courses being offered by Sonoma State University and Napa Valley College this summer.